Had the honor recently of participating in a local event, Pastels on the Plaza, which pairs artists and local businesses for a morning of fun, debauchery, and pastel chalk up one’s snoot. All in the name of charity, of course. Each business purchases a sidewalk square on Arcata’s plaza, and our artists come up with an original drawing to represent our business, and in four hours or so, actually draw it on the sidewalk square. Yes – the drawing on the left? 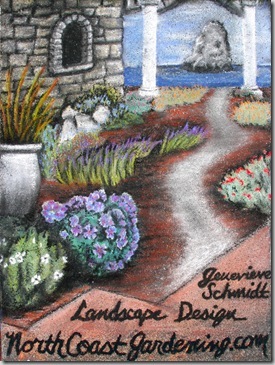 Was done in only FOUR HOURS on the freaking sidewalk using dusty pastel chalk, people. Can you imagine??? Getting to walk around and see all the artists at work, as well as check out their pastels when they’re finished, is beyond inspiring. Our well-known local artists like Duane Flatmo, Linda Parkinson, Joan Dunning, and Alan Sanborn all had squares, but what makes me the happiest to see is all the lesser-known artists who create absolutely brilliant work under such demanding circumstances. My artist wrote a blog post about the 2011 Pastels on the Plaza Event, so if you’re keen to see some of the best work of the day, head on over. And thanks for a fantastic square, Trev! Beautiful! Something like that would take me…um….my entire life! I’m always amazed at artists and how quickly they can create something so beautiful! I know, Carri – me too! I did the lettering and it took me like an hour and came out wobbly. I am just relieved I use a CAD program to do my landscaping plans, and don’t have to draw them by hand anymore. Thanks, Monica! I’ll pass your compliment on to the artist!